I love the idea of making resolutions, but I’ve never once succeeded at sticking to a resolution. Heck, I typically struggle with monthly or weekly goals. For years, I tried to set resolutions or monthly goals. I even tried bribing myself or setting up mini-milestones, rewards systems, accountability, etc. You name it, I tried it. A couple of years ago, I finally admitted to myself that resolutions and goals just don’t work for me. I wasn’t sure why, I just knew that setting resolutions was setting myself for failure and the accompanying guilt. 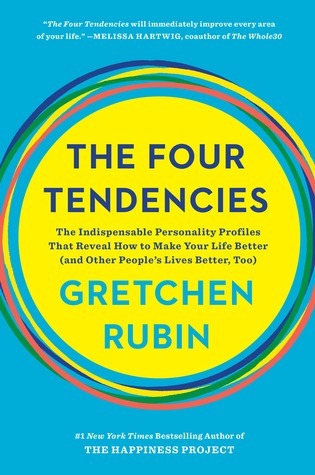 Last September, I read The Four Tendencies by Gretchen Rubin. In it, she explains that her research has suggested that there are four main tendencies: Upholders, Obligers, Questioners, and Rebels. At first, I assumed I must, absolutely, without a doubt be a questionner. After all, I question pretty much everything: Why do I need to go to bed on time? Why do I need to do homework? Why do I need a boyfriend? Why do I have to read classics? Why do I have to get married, have kids, buy a house? I did the quiz and immediately scoffed at how little she knew. A rebel? As if! Honestly, I only kept reading because I wanted to prove to myself that either her quiz was flawed or her theory was wrong. I knew for a fact that I wasn’t an upholder, I was pretty sure I wasn’t fully an obliger, but surely I must be a questioner! The more I read, the more conflicted I became. On one hand, she clearly knew what she was talking about and it seemed that she was on to something. On the other hand, I wasn’t fitting into any of the tendencies (or their subgroups). By the time I got the the rebel section (the last), I was convinced that I must be an outlier. But, her little quiz was right. I’m a rebel: I do things my way, I push back when people try to convince or oblige me to do things their way, I rarely stick to to-do lists, I refuse to abide by silly work hierarchies, … essentially, I live by my own rules. I guess I never saw myself as a rebel because my own rules happen to be in line with social graces. I value a quiet, peaceful, and equitable life. I like being accommodating and polite. And, I think that makes me seem like an obliger or questioner. But, I’m full on rebel. So, how does this relate to resolutions and goals? Well, they’re basically rules. The point of a resolution is to make yourself adjust your behaviours to meet certain criteria or ideals. We make rules (eat less, exercise daily, read X books a month, etc.) in order to get the result we want. For a lot of people, this is a system that works really well. A lot of people have the means to convince themselves to follow a rule: enjoying the challenge, finding someone to be accountable to, finding the proof that it’ll be beneficial, etc. But, for rebels, we need consequences, and resolutions typically don’t have significant consequences – if you don’t do it, life will go on as before. Now I have a much better understanding of why resolutions and goals don’t work for me. This has made me feel much less guilty, because I don’t feel like I’m a lesser person for not making resolutions. As for the book: It’s an interesting read and it gave me a lot of insight into myself and into other people. I feel that I’m in a better position to understand where people might be coming from and how I can work with them. Or, why I sometimes clash with some people. Even if self-help books aren’t usually your thing, you might find this book interesting. Previous What’s your favourite book?